In case you missed it on my social media, my husband and I recently did a surprise living room makeover at my parent’s house! It was their 40th wedding anniversary on July 3rd, so they went away for the long weekend to celebrate. As soon as they left, we headed over (luckily they live just across town) to get started. We emptied and cleaned the entire room, painted, moved the furniture back in (along with several pieces we’d refinished ourselves), put together a new bookshelf, spray painted their lamps, and hung curtains, a new photo ledge, and some other art and photos. All in three days, and with our almost-5 year old and 2.5 year old in tow. It was definitely a LOT of work…but so completely worth it in the end, and I don’t know of two more deserving people on the face of the planet. They love it, I love it, and it’s DONE, so all is well. Needless to say, we were working on a pretty tight budget for this makeover, since my parents didn’t know it was going on it’s not like I could ask them for a budget to work with. 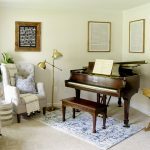 We used most of their existing furniture, especially the larger pieces, but in order for it to feel like a new space I knew we’d have to add some “new” furniture pieces. 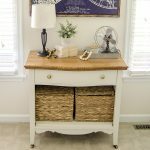 I’ve only ever really done two furniture makeovers before – the first was a gray chalk painted dresser for my daughter’s bedroom, and more recently a farmhouse cabinet for our piano room – but it turned out really well and I enjoyed the process, so I figured I’d try my hand at a few more furniture projects for my parent’s living room. My mother is from Florida, and always longs for more sunshine (especially in never-ending Pennsylvania winters) so I knew I wanted to go with a bright, airy, almost beachy feel for their living room. 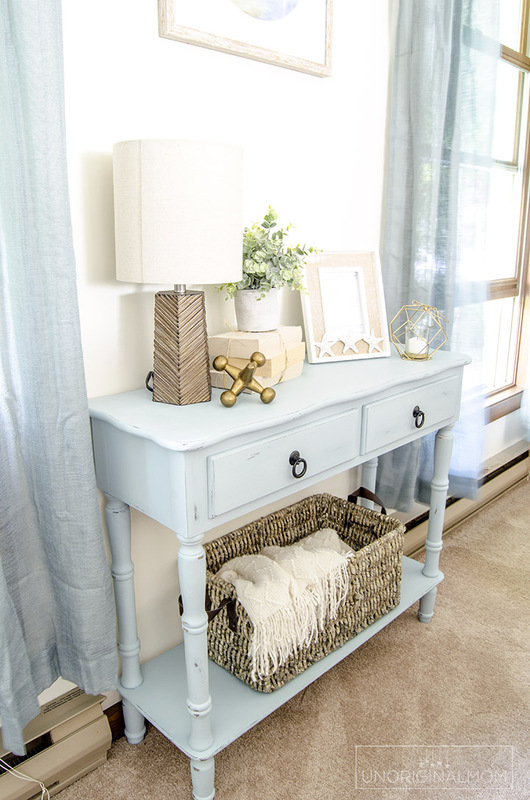 With their dark wood trim and dark brown sofa I knew I couldn’t go all-out with a coastal style, but I still wanted to throw in some lighter furniture and pops of beachy color. 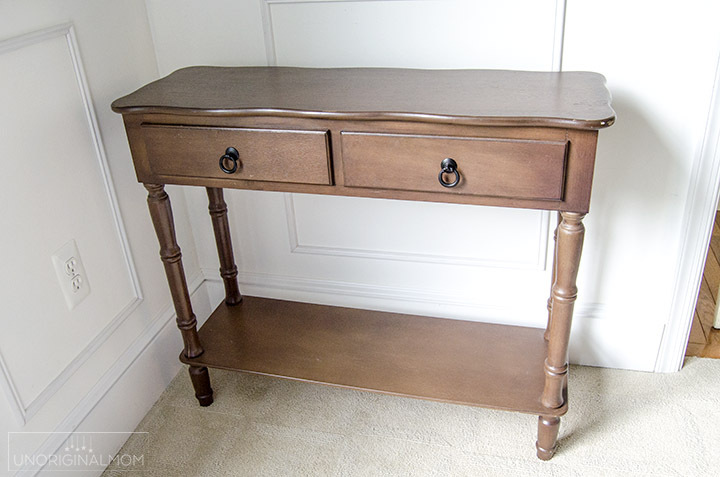 That’s just what I did with this side table! I found it on Craigslist for $40, which I didn’t think was bad for a solid and sturdy piece of furniture like this. There were some cosmetic issues, though…a few scuffs and scratches and a crack down one leg, but nothing I couldn’t handle. 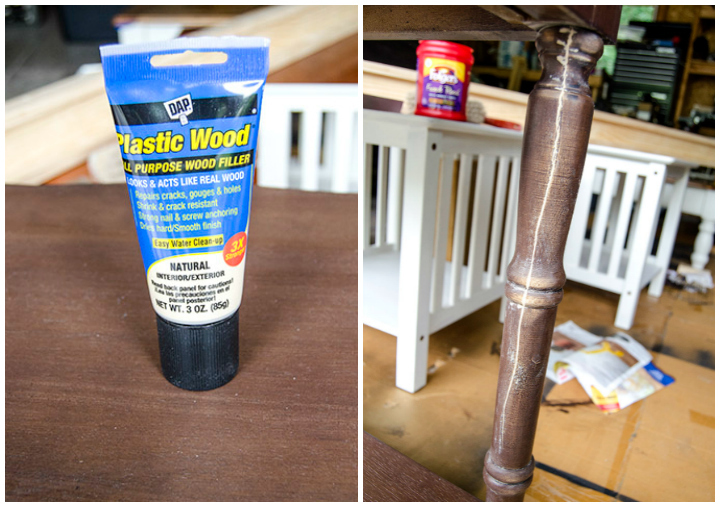 I filled the crack in the leg and a few other spots with this wood filler, then gave the whole thing a quick sanding and a good wipe down. Then I started to paint! 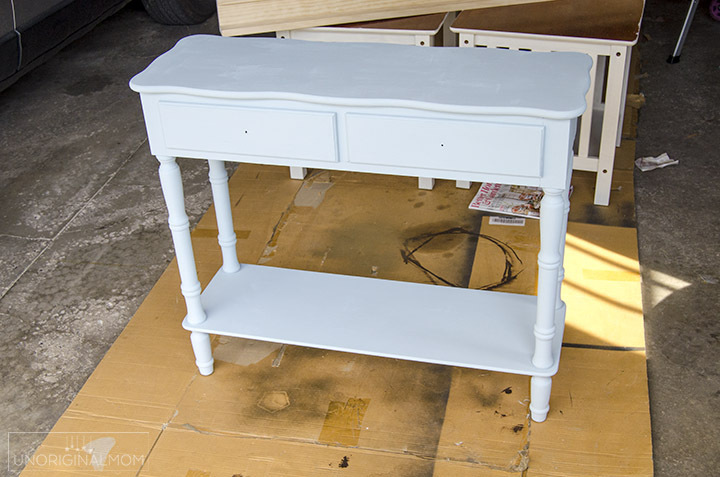 I was looking for a coastal blue, like a robin’s egg blue, but I couldn’t find anything like that in stock locally. 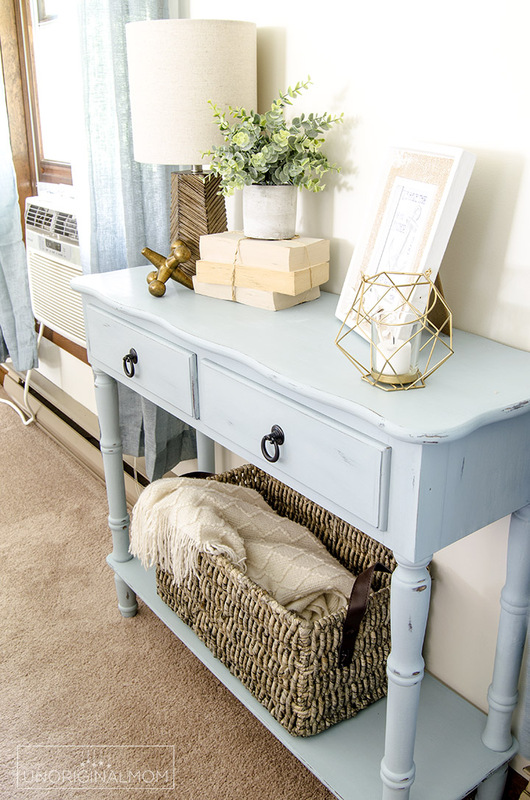 I’ve used DecoArt Americana Chalky Finish paint before, though, and knew I could find it at Michael’s. I already had a container of the color Vintage, and decided I’d pick up a container of Serene and see how they’d look when mixed together. 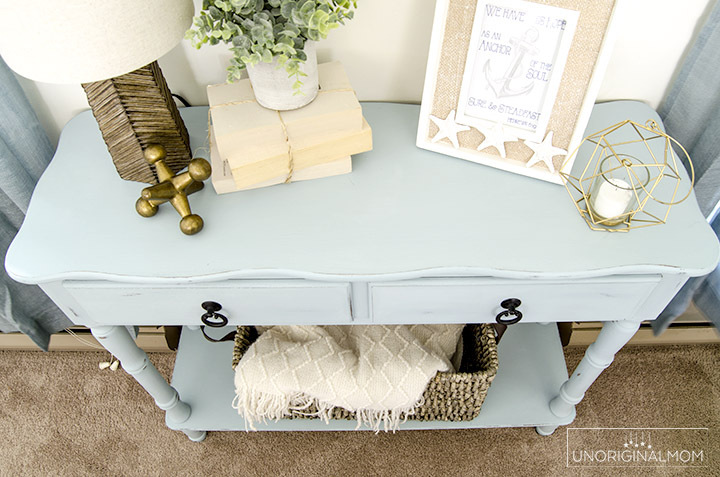 I discovered that a 50/50 blend of Vintage + Serene = the perfect coastal blue! 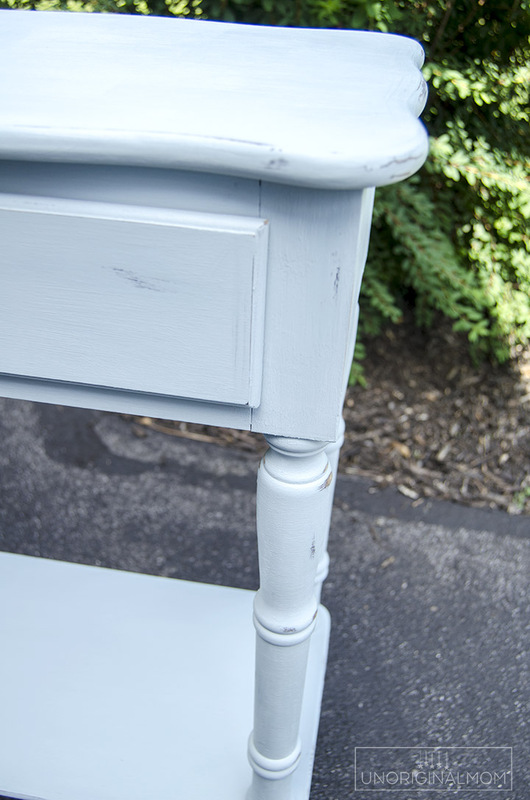 After two coats, this table was looking mighty fine. 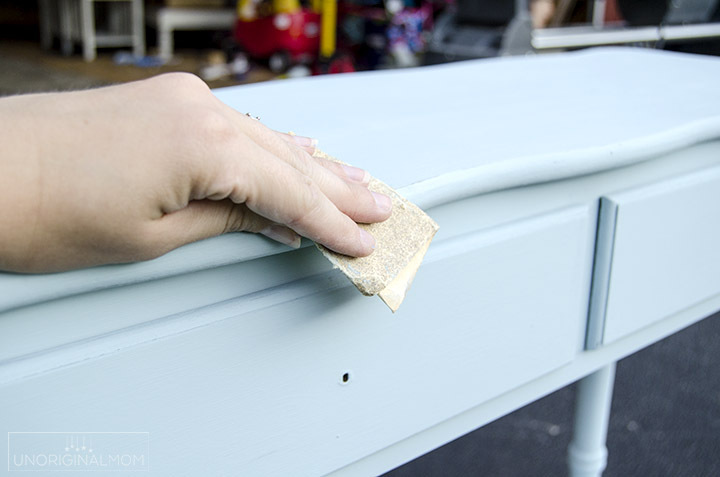 I wanted a distressed look, though, so after it had dried overnight I took some sandpaper to the corners and edges – basically anywhere that would naturally show more wear with age. 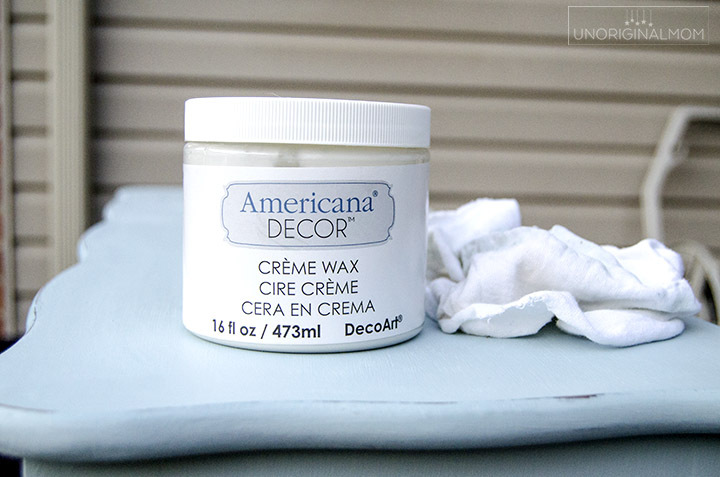 Then I sealed with a coat of Americana Decor Creme Wax. 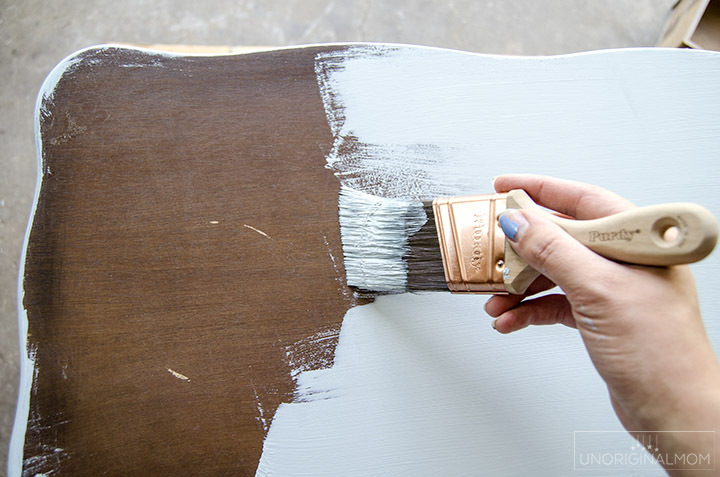 It deepens the color just a bit, smooths out the finish, and protects the paint. And here’s how this beauty looks in my parent’s living room! The lamp is from Walmart (believe it or not! and the basket was a HomeGoods find. I just love how the color turned out, don’t you? 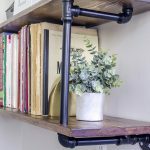 ORC #6 – Industrial Farmhouse Office/Music Room REVEAL! That is too cute!!! Y’all did a great job!! Love the look, that has inspired me. I’m in the process of doing a beach theme room, so I will be shopping for some furnishings..Thanks for showing me the possibilities. LOVE this! Found this on Artsy Chick’s post on 8/1. Lovely! Hope I can do something similar for my home! Love the color. So serene. Your paint project turned out nice. You did your parents proud! Lol! Aw, thanks Monica! 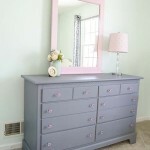 I love this color too…I want to find a way to use it on something in my house!